Best Nail Top & Base Coat Ever! Hi girls! Okay, so I have another great product to share with you today…sorry about all of these, but I’m on a roll apparently! If you really hate them, let me know and I’ll stop immediately ! Today I’m talking nails. 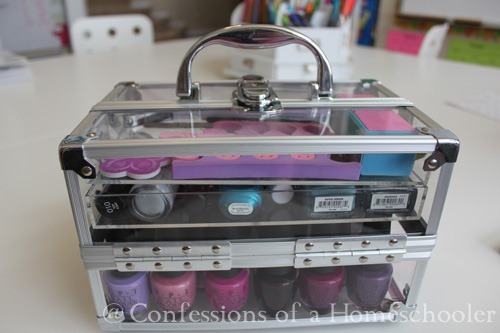 Nail polish and nail polish organization. I don’t know about you, but I’m very rough on my nails. Having four children, homeschooling, taking care of a home, and blogging all take a serious toll on my nails. Typically they break easily, and nail polish? Oh forget it. I just didn’t even bother since I knew it would get chipped off that very night as I did dishes. 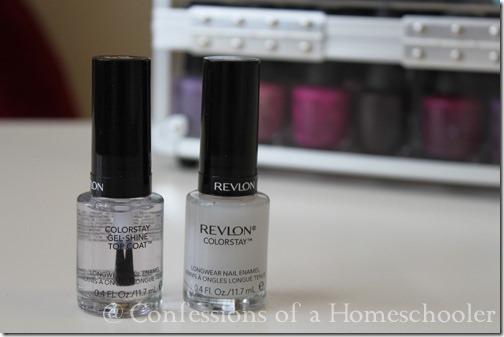 I found Revlon Colorstay Top Coat and Revlon Colorstay Basecoat. Oh my heavens…yeah! No kidding ladies, this is my new holy grail for no-chip nails. I’m not sure what’s in these…probably something terrible…but whatever it is, my polish actually…gasp…stays on! No chips, no kidding. Really my polish lasts so long with this, I’m usually bored of it and end up taking it off before I see any chipping! The other thing that I’ve noticed is that my nails aren’t breaking either. It doesn’t say anything about strengthening your nails on the packaging, but I think it does. I don’t let my nails get long anyway, too impractical for my life style, but at least they’re all about the same length now and long enough to look nice when polished. Now, let’s talk polish. My numero uno polish brand is O.P.I. It is good quality, they have a TON of colors to pick from, and they glide on smoothly which I like. 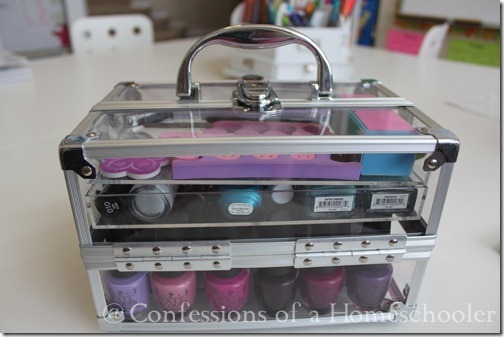 I recently found this cute acrylic cosmetic case hiding underneath my sink. It’s been there for years and had VERY old makeup in it that was from a gift of some kind. Probably from back when I was a teenager or something. But I kept it, and now I’m finally using it! 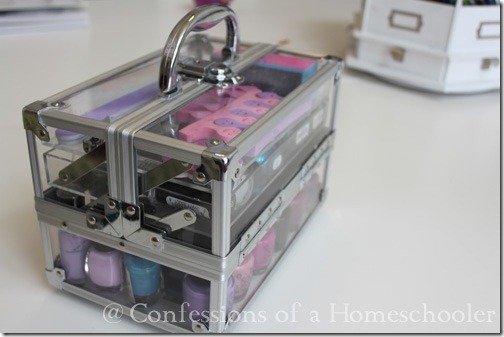 So, little to my knowledge this thing makes a great nail polish caddy! 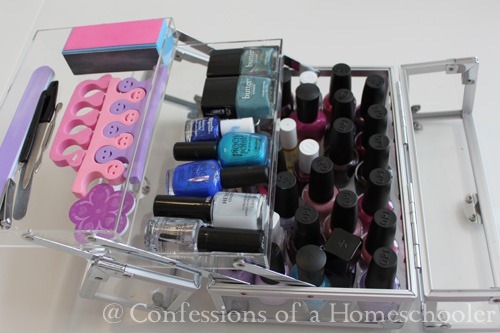 When opened fully, it has two drawers that fold out to give some added space for all of your supplies. 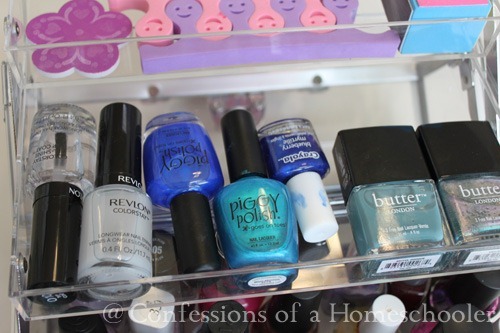 And with 4 girls in the house…lets just say we paint a lot of nails. 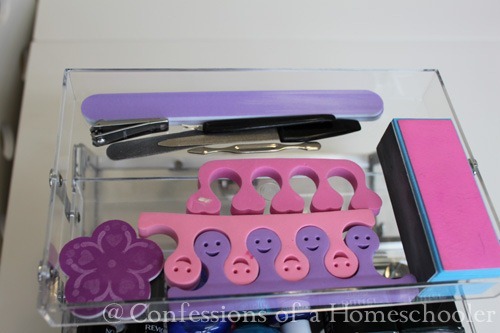 SO the top drawer holds all of our supply type things, files, clippers, toe separator thingies, and a buffing bar. 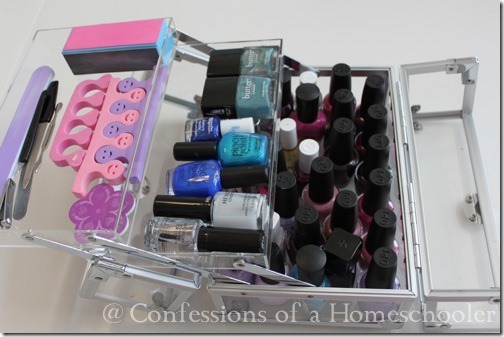 The next one holds my top/base coats, and some of the crazier colors…namely blue…and really ones that were flat enough to fit in the tray. 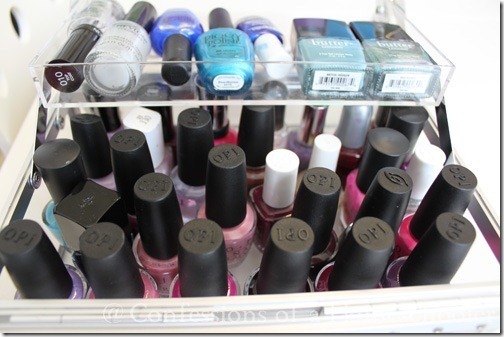 The bottom large container holds all of our polishes. You’ll notice that most of them are O.P.I. I’d just rather pay for them than purchase the cheap ones that actually peel off your nails in about 5 minutes. 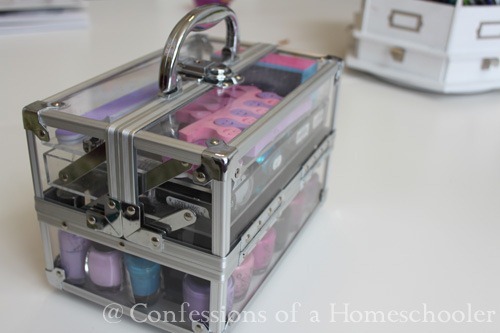 So here it is, our nail polish organization caddy all closed up. It has a nice handle on it too that allows us to grab all of our colors at once and have a painting party. Or a painting assembly line which is more what it’s like at our house. Today’s post is brought to you by the color Anti-bleak from O.P.I. One of my new favorites, kind of a cranberry color. Just kidding about the “brought to you” part above. I’m not affiliated with any of the companies above, just wanted to share some great stuff with you, my awesome readers! 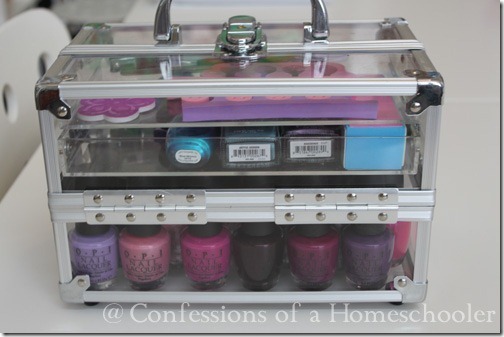 Have a favorite nail polish or polish organization tip to share? Leave a comment below! Now that my polish actually stays on, I’m game for new colors! YAY! I have 2 girls and while we homeschool we also run a tiny little farm, more of a “farmette”, and this is great news! Often, we forget that we are ladies and forget to make ourselves presentable. This will be such a fun mommy/daughters bonding time and can give us just the boost we need to take better care with our outward appearance. God created us in his image and we are not shining examples of that most days. Thanks so much! I would have to agree. Your blog is the most amazing homeschooling reference for me but I am not into the product awareness info. Hi Erica! I love your product posts…why…well because as a homeschool mom we usually put ourselves last on the list or not even on it! These products are simple ways that we can take a few minutes for ourselves and have a lasting effect such as the smooth lips or nail polish that stays on. Most moms feel guilty about spending any time on themselves. That all their time should be spent on others. Although the Bible says to put God first, others second, and yourself last, most of us too often follow put God first, otherse second and yourself never! Thank you for reminding us that we are important too and taking a couple minutes out of busy life to take care of ourselves is ok! I totally agree with Amy I enjoy your product post because it shows there is more to you then homeschooling. I can relate more and enjoy your blog more knowing you think of other things just let me. It doesn’t have to be all about school all the time, because lets face it as mom we are faced with more then just educating our kids. By the way I am a huge fan of your nails I love to get my nails done and I love doing them myself , but now I know where to spend the money so that they can last long. TFS!! Hi, Erica! I love the product posts! It’s refreshing to read something that concerns just myself every once in a while! Your blog is fabulous, and I love your ideas! I just like to see what you have for us on Fridays, as far as a new product goes! I had been noticing in your recent videos that your nails always look great, and I was wondering how you kept them from chipping and peeling! So, I was very excited this morning to read your product post for this week! I am going today to get some of that top/base coat! Mine, as yours, chip and peel after a round of dishes and cleaning! Thanks so much, and please keep it up! 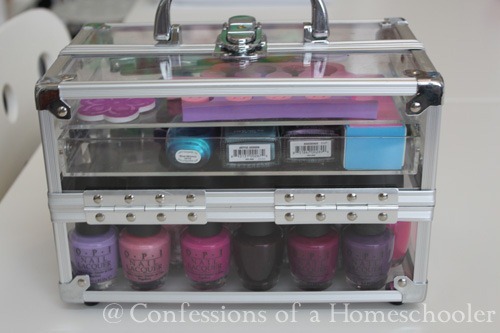 Can I just say that after I watched your video on your homeschool room tour, I was not only inspired in the homeschool realm, but also in the nailpolish realm. I immediately went and painted my nails a really dark purple (which I never do – I tend to stick to red). And then after watching your next video, I painted my nails silver. I’m enjoying the switch from the usual! I probably have about 50 shades of nailpolish, but usually only wear three. 😉 So, I have no problems with you posting about nails. I may just have to give this new anti-chip stuff a try! Thanks. I love these posts. I am reminded that not only am I a homeschool mom, but also a woman. I have always enjoyed taking care of myself, but with 3 beautiful children and one a 9 month old, brushing my teeth has been so refreshing. I recently left Fridays light for this particular reason.n I want to start taking care of myself, like painting my nails, waxing, plucking eye brows…..and am loving it. Thank you for these posts. Love the product posts – a fun break. 🙂 I use a pink caboodle from Target for my nailpolish. It has 2 little shelves on each side when you open it. Thank you thank you thank you!!! I’m going to get these two as soon as I can. I have 4 boys and a bundle on the way, homeschooler as well (probably a given) and photographer mom. Painting my nails is one of those things that makes me feel pretty. It’s a pain when my nails start to chip after a few hours or a day. So excited to try these out! Thank you, again, Erica! Thanks for sharing I have been wanting to keep my nails painted but hesitated because of the chip factor but maybe I’ll give it a try and make it a girlie thing for us. I agree Bobbie! Good point! 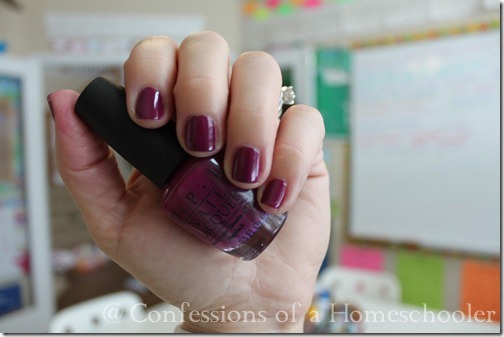 I don’t consider myself a frumpy homeschool mom just because I don’t wear nail polish. Not a fair comment… And my husband hates nail polish!